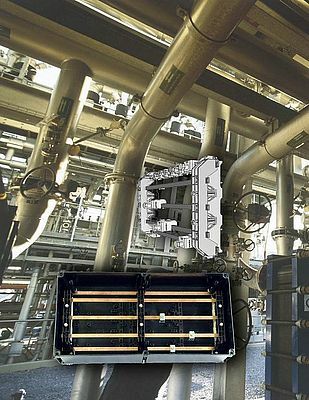 Launched by COOPER Crouse-Hinds the GHG 758 explosion-proof (Ex e) bus-bar systems for metal and molded plastic enclosures is suitable for use in hazardous environments with extreme ambient conditions. It utilizes undrilled clamp technology for the connection of cabling, therefore enabling faster, more cost effective assembly and more efficient distribution of electrical energy. Operating in ambient temperatures from –55 to +55 °C, the system is available in high rated currents for 250 and 315A in Ex e certified technology for Zone 1 hazardous areas. The system provides users with an increased length of usable bus-bar rail of up to 6,300mm. It has a short circuit rating of 47 kA. An optional removable plastic cover is also available, which also provides additional cut-outs for measurements. Suitable for use with the company’s GHG 62 range of encapsulated circuit breakers up to 63A, the system can be used in conjunction with the modular range of GHG 619 enclosures and is a more cost effective solution for many Ex e IIC applications.